Last June marked one whole year since I got my powerchair, one year of independence and freedom. 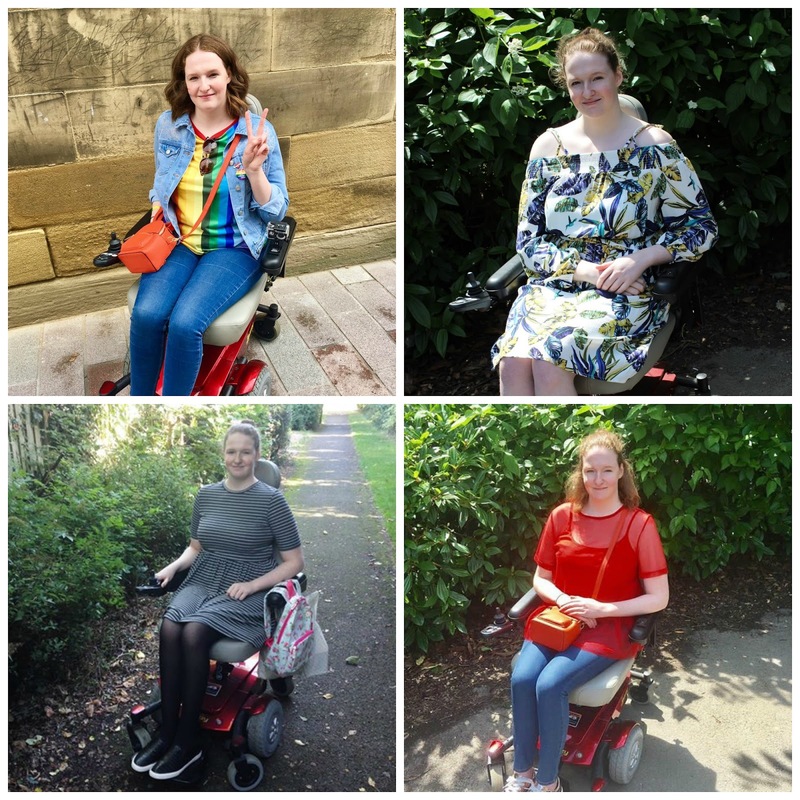 One year since friends, family, fellow bloggers and strangers changed my life by raising thousands of pounds for me to claim back my independence, after being left housebound most of the time due to not having a suitable wheelchair. I remember when I first got my powerchair, I was nervous to use it but excited as well. Up until that point I'd been reliant on family members to push my manual wheelchair, meaning I often only left the house once a week, if that. When I did go out I had no control over where I went either, with someone else in control of me. Suddenly a whole new world had opened up to me when I got my powerchair, I knew that there would be challenges as well though. One year on and it feels like that first day of having my powerchair was a lifetime ago, much has changed since then and I've learnt a lot. I thought I'd mark the year by writing a little about my relationship with my powerchair and how it has developed. The post idea was suggested to me by one of my lovely twitter followers, so thank you Tiffany! At first I was really excited to use my powerchair, I'd spent so long being trapped inside my home so the idea of being to go out whenever I wanted (pain permitting) was such a foreign but thrilling idea. Underneath all of that was nerves though. I was nervous about how people would look at me and treat me. I was nervous about navigating busy shops, getting the bus and being faced with accessibility issues. It took me months just to build up the confidence to get the bus on my own. I finally did it though and it was nowhere near as bad as I had built it up to be, the freedom that getting the bus gave me far outweighed the nerves that had once consumed me. The thing with confidence is that it can be knocked though, it can disappear as quickly as you build it up. As you've read on my blog getting public transport as a powerchair user can go really well or really badly and for the past year my confidence surrounding getting buses and trains has almost been like a rollarcoaster. A good experience would leaving me feeling like I could go anywhere and do anything but a bad experience would leave me wondering why I bother going out. The rollarcoaster is beginning to stabilise though, I've built up confidence. A different kind of confidence though. I now speak up for myself, complain when things go wrong and I make sure that my basic rights are met. I'm still nervous when I go to get the bus but I know that I have the tools to deal with any situation that may arise. When it comes to my powerchair itself though, I love it. People have this assumption that wheelchairs are bad but I love my powerchair because it lets me do so many things. It allows me to go shopping, see family and friends and attend charity meetings. I've achieved and done more in one year thanks to my powerchair than I've done in the previous 18 years of my life. Wheelchairs are not a bad thing and they certainly aren't a prison sentence. They can be freeing, they can open doors that you thought were locked forever. I owe so much to my powerchair and the people that donated money towards it. My relationship with it is ever changing though. As my health has worsened my powerchair has become unsuitable for me. It's too basic now, the one thing that is meant to give me freedom is what can often hold me back now. The seat can be uncomfortable, the suspension isn't good enough and it doesn't have the tilt and recline features I now need. I've outgrown it. It's given me a whole year of independence that I wouldn't have had without it but it's time to move on now. It's looking like NHS wheelchair services aren't going to be able to help me again so I'm looking at needing to raise over 7k this time for something suitable. It's another hill to climb, another battle to win but it's necessary if I want to continue living as independently as I do. However, when the time comes for me to wave goodbye to my current powerchair I'll do so in the knowledge that it's served me well and given me a chance at living again. I'll never begrudge it for not being completely suitable for me, I will always be grateful for the chances it gave me and I really hope it goes to someone who will benefit as much as I have from it.